►Bringing you up to date . . . This project has turned out to be much more cumbersome than expected. We have had trouble getting people interested in a “small” job. The prices we have gotten were double what we were estimated in the fall of 2017 when we began fundraising. Work has been done on the driveway entrance. The road was widened to two lanes. Crushed asphalt was laid. This is prepared so that we can pave over this if funding allows. That was phase 1. Phase 2 included repairing the south end of the parking lot where the asphalt was breaking off and repair in front of the chapel where the dumpster truck has caused damage. This necessitated moving the dumpster, and a fence around it will be added. Phase 3 will be to improve drainage by raising up the driveway and sidewalk at the fellowship hall ramp. This area is under water when it rains. When these three crucial areas have all been addressed, we will reassess where we are and what funding remains. At that point we will decide how to proceed. Ideally there will be sufficient funding to get the entrance paved. Jim Runtz, who is on the Presbyterian Home for Children board and is knowledgeable about First Presbyterian Church in Wetumpka (close to Talladega) has offered information in case our congregation wishes to send contributions to assist in the restoration of their church that was destroyed in a tornado. This church has significant kinship with Swift, in that both are “historical churches” on the state registry, well over 100 years in continuous service to their respective communities. Swift Presbyterian Church celebrated the 10th anniversary of service for the Rev. 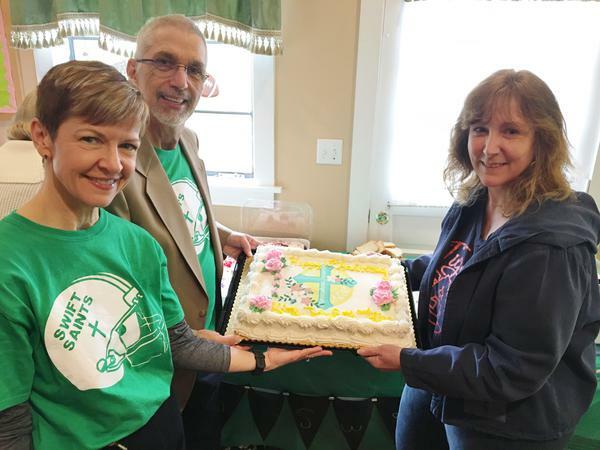 J. Keith Cardwell, pastor; Lisa Cardwell, music director; and Jody Beth Melton, commissioned lay pastor, with cake and special plaques to commemorate this event. 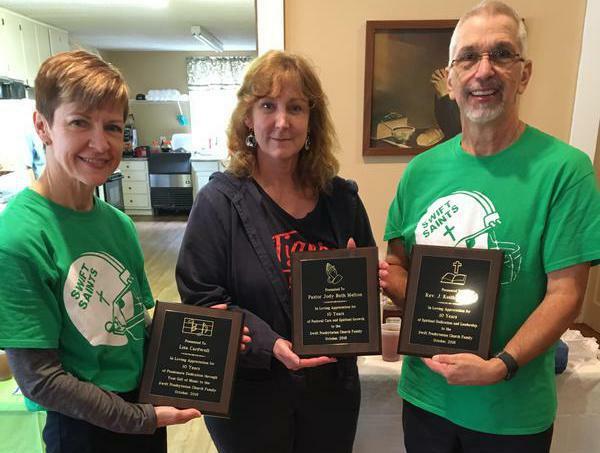 They were honored by the congregation at the stewardship tailgate party on Nov. 4. The three were also recognized during worship services in October (Pastor Appreciation Month). They were presented gift certificates on behalf of church officers, staff and the congregation. Brett Cardwell was elected to fill a two-year term. All others were elected to serve for three years. and people’s willingness to serve. Click the link to read or listen. Please notify the office if you can assist. Thirty-six families each received a bag of food from Swift Church’s food pantry on April 24. The need is always great for food to help people in the community. If everyone brought one item this week or next, we could refill our shelves before the next distribution on May 8. Food pantry needs at this time: canned fruit, breakfast cereal, peanut butter, jelly, canned soup, spaghetti sauce, spaghetti noodles, rice, canned pasta. Thank you for caring and your extravagant generosity. Want to learn how to serve the church as a projectionist? Swift Church is looking for folks to learn how to be projectionist on Sundays. This involves loading up the bulletin material, any photos, announcements, etc., and operating the projectors in the loft on Sunday mornings. Usually, projectionists take a month turn at a time, generally three times a year. Those who already know how to do this will train you. Contact the church office or Pastor Keith. After a break, we heard from the insurance board, the Alabama Presbyterian Home for Children, the Texas Presbytery Foundation, and the board of pensions. The docket was approved as presented. The minutes from the Feb. 9 and 10 scheduled meeting and the June 13 called meeting were approved. Elders and visitors attending for the first time were introduced. The June 30 financial report was approved and the 2019 budget presented. Host churches for the next two presbytery meetings will be Spring Hill Church, Mobile, for Feb. 8 and 9, and First Church, Andalusia, for Aug. 20. We then heard from the committee on ministry, committee of preparation for ministry, Guatemala Mission Partnership, UKirk, and Presbyterian Women. Under the committee on ministry, we received three honorably retired ministers into the Presbytery of South Alabama: The Rev. George H. McDonald and Rev. Barbara McDonald, both from Monmouth Presbytery, and the Rev. Van Edington from the Presbytery of North Alabama. A discussion on the interim executive presbyter was then held with various ideas presented from moving very quickly with the hire to a much-more-time-consuming search. Lunch was served and the meeting was adjourned at approximately 1 p.m.
the church driveway and parking areas. Have you made a pledge or donation yet? ►Click here to go to the new website for the Presbytery of South Alabama. ►Click here to find out what the Swift elders have been doing and discussing. Susie Alexander is our “go-to lady” to schedule flowers for worship. Many of you had previously reserved certain dates “in honor of” or “in memory of” someone or for a special event in your life. Please contact Susie by telephone or email to schedule that special date. She can be reached at 943-4145 or thfairynfoley@gmail.com. Can you help provide a meal for UKirk students? UKirk South Alabama is a campus ministry at the University of South Alabama that is supported by the Presbyterian Church (USA) and the Presbytery of South Alabama. They have weekly meetings on campus where they break bread together and share a message. They have a need for people to help them with meals by preparing, cooking, and transporting the meal to campus, and then people are encouraged to stay for food and fellowship with the students. If you would like to provide a meal for a Monday night, please call/text Philip Melton at 251-213-6505, or go to the website for more information, https://mealtrain.com/3l9nrw. On Fridays from 9 to 11 a.m., South Baldwin Literacy Council is offering a new Bible-based English as a Second Language class in the fellowship hall of Swift Presbyterian Church. This class is free to attend and is being taught by the council’s ESL coordinator, Esther Tillmon. This class is for mothers and their preschool children. A bilingual copy of the New Testament will be provided at no charge to participants. Mothers and their preschoolers will improve their English while learning the stories of Jesus. Please continue to pray for these students and their ongoing instruction. Hearing assistance devices are available in the back of the sanctuary during worship services. Please consider providing a meal for a youth event (grades 5–12). To find out more, contact Kathy Menk by calling her at home (971-6509) or by sending an email to mkmenk9010@gmail.com. ►For news about Swift Church people and their achievements, awards and activities, click here.